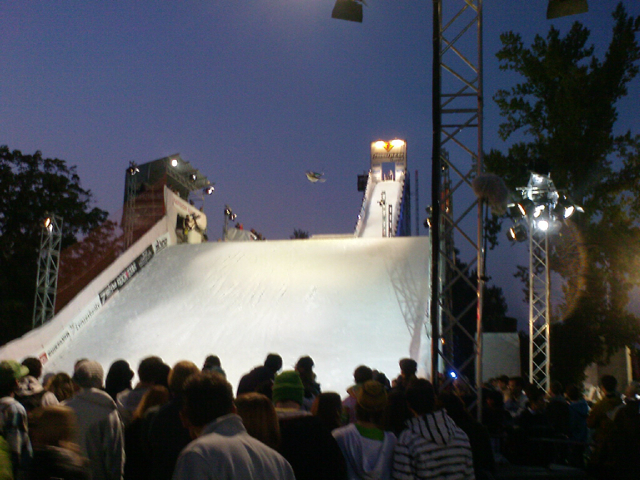 For those of you that think Switzerland is just full of uptight bankers and other financiers, try spending an evening at Freestyle – an extreme sports festival on the lake in Zurich, and nestled up by the headquarters of several major insurance companies. Freestyle is all about skateboarding, free skiing and snowboarding and something they were calling FMX – presumably freestyle motocross. The weekend was a program of competitions, showcasing some pretty amazing athletes doing gravity defying tricks. The event has a 32m high ski ramp, leading down to a kicker – it’s pretty big when you see it in real life. The guys were bombing it down and pulling big air, rotating this way and that. It’s got to get you excited about the winter season. I’d not seen the FMX before, and to be fair, I wasn’t so impressed with the stinky diesel coming out of their bikes, but I was blown away by some of the stuff these guys did. You’ve got to reckon that bike they’re spinning around weighs a fair bit – I saw one guy launch off the ramp and push his back wheel round so it was facing the way he was going, before yanking the whole thing back and landing – another guy took off and fully let go of his bike, flying like superman, before grabbing it back and safely nailing the landing. I found this website with some freeze-frame pictures of some of the performances at the event: Panorama Journal. Pretty cool. We were over at Freestyle promoting our brand at the stand of our friends, Disaster Industries. These guys make beautiful custom snowboards and skateboards from wood. They’re works of art. The Disaster guys make boards for grown ups (a custom board is like a bespoke suit – expensive), so compared to many of the other stands at the event, they seemed a little mismatched to the majority of the visitors – who were teens, sporting what on of the Disaster boys was calling ‘no style’ fashion. You know, bright coloured hoodies and trousers big enough to fit a family in. All the kids wanted free stickers, free flyers, free whatever – as long as it was free. By the time they hit the next stand, half of what they’d picked up was on the floor. It was crazy, after a couple of hours the floor would be covered with waste paper. People weren’t dropping rubbish like food or stuff like that – nope, just flyers, stickers and anything that they’d picked up for free and discarded. It was, I have to say shocking. One of our Swiss hosts said – “it’s not very swiss, eh?” Not quite, no. Having said that, there were some positive differences from other similar sized day festivals I’d been to (think those big all day concerts in Hyde Park). For one thing, the fast food on sale was remarkably good. And the toilets were clean. I was also impressed with a bottle collection scheme they were running. Whenever you bought a drink, it was expensive – about £3 for a soft drink – but you were given a little plastic token and when you returned the empty bottle you got about £1.20 back (making the drink a more reasonable price). I did laugh to myself that it was a good idea as I picked my way through the mountains of waste paper. Freestyle’s an awesome event, but I’m glad they’re thinking about sustainability for next year. I met the consultant tasked with bringing it to the show next year. She’s got a big task ahead of her when you consider that two of the event’s main draws are a massive snow ramp built in the warmth of late summer, and a bunch of crazy FMX daredevils burning fuel to do backflips. But hopefully she can sort out something with all that paper for starters.